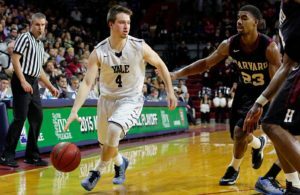 A game that had the promise of a close, knock-down, drag-out affair turned out to be anything but that as Harvard cooled off Yale (12-4, 2-1 Ivy), which had won eight straight in and out of the league. The Crimson, won 65-49, never trailing. Robert Baker, who had a career high four 3-pointers, and Justin Bassey each scored 13 for Harvard (9-7, 2-1 Ivy). The Crimson, led 35-20 at halftime and never by less than 10 after the intermission. Its biggest margin was 60-41, giving the home fans a Lavietes Pavilion little to worry about. 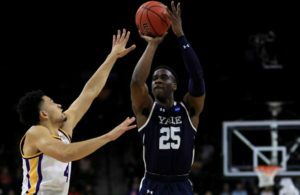 Yale only shot 31 percent from the field and 17 percent of its 3-point attempts. It was definitely not a good visit to Cambridge for the Bulldogs. Aside from losing the game, their bus from New Haven was delayed in traffic and did not arrive until about an hour before the tip off. Despite the absence of suspended star Devin Cannady, Princeton had no trouble beating Columbia in New York, 55-43, and emerging as the only undefeated team (3-0) in the Ivy League. While Cannady, the team’s high scorer, is under suspension as a result of being arrested on Jan. 18th (for details see our previous articles), Myles Stephens took up the slack with 17 points. Princeton led 34-17 at the half, during which the Lions shot only 26 percent and missed all eight of their 3-point attempts. This was the sixth straight win for the Tigers while Stephens had his fifth double-double of the season overall. Columbia shaved its deficit to seven points in the second half, only to lose by 12. The mystery of the Pennsylvania Quakers (12-7, 0-3 Ivy), continued in Ithaca, N.Y. on Friday, when one of the Ivy League pre-season favorites became the only winless team in the conference after in three games. 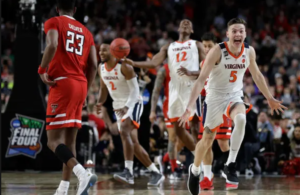 Losing a pair to Princeton may have been understandable but dropping this one to Cornell, 80-71, could be labeled a definite upset. This was the first time in the last 12 games between those two programs that the Big Red came out on top. Matt Morgan, of Concord, N. C., who twice declared for the NBA draft and is a genuine pro prospect, had 25 points. He put the finishing touches on the Cornell comeback win. Cornell, (10-9, 2-1 Ivy), which trailed 69-67, closed on a 13-2 run, including Morgan’s seven points. In that span Penn was only 1 of 7 from the field and missed all five 3-point attempts. 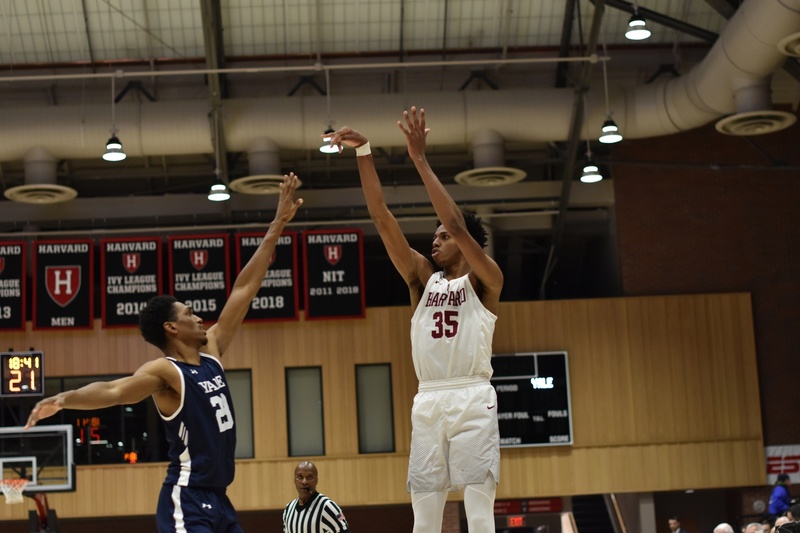 AJ Brodeur had 17 points and 16 rebounds for the Quakers, who only a week ago won the tough Big Five championship, after beating all four of their Philadelphia opponents. Seems the Ivy League is a different ball game. Going to Hanover, N.H. looking for its first win in the Ivy League, Brown (13-6, 1-2 Ivy) got what it needed despite trailing Dartmouth (10-9, 1-2 Ivy) by five points, 54-49, with less than three minutes remaining. Brown pulled it out, 79-71, after taking advantage of four straight turnovers and gaining a 55-54 lead. The contest was not decided until a Dartmouth 3-point try went off the rim as time ran out. Obi Okolie (Brown) and Chris Knight (Dartmouth) each scored 15 points.